What if you could listen backstage as your favorite country music artists prepare for a show? You’d hear them telling personal stories, sharing the latest jokes they heard, and maybe even warming up for a few of their songs. 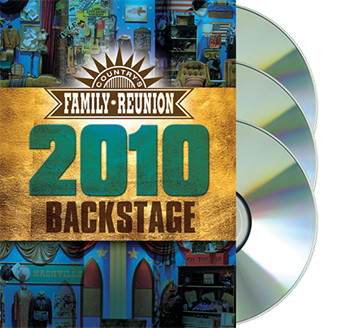 Well, that’s exactly why we filmed “Country’s Family Reunion: 2010 Backstage.” We wanted to give you over 3 hours worth of insider footage on 3 DVDs not seen on any other Country’s Family Reunion series.